[dropcap]A[/dropcap]fter two hundred years of British rule over the Indian subcontinent is the near abolition of dynastic rulers of various hues divided across the country and reshaping its political map as one singular entity. After getting independence, the new-born’s new identity as a democratic nation was indeed too promising and equally challenging. Ironically, the founding fathers and leading protagonists of this new nation were oblivious that the seeds of yet another dynastic-rule were being sowed through its very first head of the state-Jawaharlal Nehru. Even in hindsight, it is difficult to presume that Nehru himself would have had such an ambition to leave a long legacy behind. Yet, even as the history of modern India is unfolding, sixty-five years after that historic ‘freedom at midnight speech ‘ by Nehru, the nation is still struggling to free itself from the spell of an enigma called Nehru-Gandhi family. From Nehru to Indira, Rajeev, Sonia,Rahul and now a new figure Robert, each one seems to be a new chapter of a long epic. Born or married into this family, the members inherits and enjoy a rare privilege-that of India’s first family. In more ways than one, the Gandhi family has continued to represent the sum total of everything that India’s oldest and largest political party, Congress may mean for the nation. Perhaps the biggest credit in carving out a cult status for this family goes to Indira Gandhi, to the extent that the legacy itself continues in her name rather than Nehru. More through her dominating persona than her vision as a stateswoman, this Iron lady instilled a culture of obeisance and sycophancy in the party, genetically altering its identity for ever. The period of Emergency was brief but remains an unmistakable mirror reflecting her resolve to create such a long lasting legacy. Her tragic death further reinforced the misplaced reverence for the family and also proved instrumental in elevating her son Rajiv to the highest pedestal literally from the oblivion. To some extent, the sustenance of awe of the Gandhi legacy could also be traced in the way the majority of us are culturally inclined as a by-product of our feudalistic existence for centuries. We seek solace and solution to our woes in cult figures or an authority that exudes power. The more detached or alluring that power, the more awe struck are we to that authority. 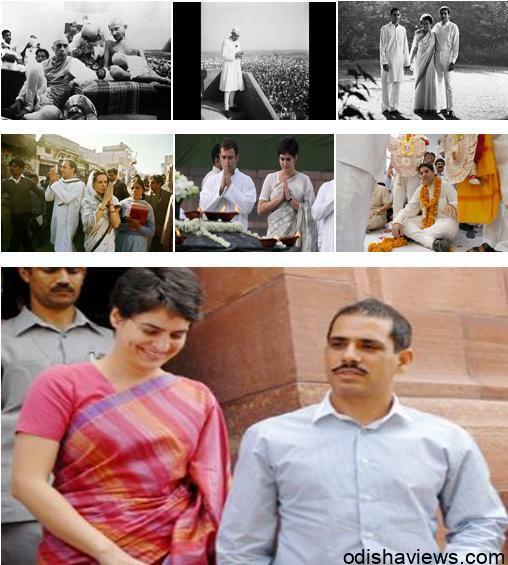 The Gandhi family perfectly symbolizes that power. Thoroughly detached in its identity and deeply arrogated in its nature, Power could not have found a more eloquent expression than in the form of Gandhi family legacy. Indira epitomized that power..Years later, Rajeev could have proved his incompetence as the PM, but again his Gandhi family tag ensured him the status of unlimited,unchallenged authority, at least in Congress party. The cruel hands of fate scripted a tragic end to this son too. Again, the mass shock and a national outrage got transformed into an instantaneous sympathy for the Family. History repeated itself, just as in his mother’s death, the sympathy wave further deepened the roots of the Gandhi legacy. It is true that no one, least of all the family itself ever envisaged such sad turn of events and fate. Tragedy is a deeply emotive and a binding event, and the family may only be the unwitting recipient of an adulation carved out of sympathy. Whatever be the origin, Sonia was now the new symbol of the Gandhi legacy. So overwhelming was the flow of obeisance of the party members that she eventually took hold of the mantles in spite of her initial firm abstinence. As time passed the wounds of the tragedy healed. What remains dominant now is the aroma of power that comes being part of the legacy of India’s first family-the Gandhi family. Sonia today symbolizes that unquestioned power that her mother-in law enjoyed decades back, her foreign origin not-withstanding. She is the fountainhead of all the policies and decision of the executive even as the nation has a full time PM in chair. The chairperson of UPA-II effectively enjoys the one person veto power over all that the cabinet decides. Sonia and other Gandhi members also do not fall under the purview of RTI being from the first family, unlike other citizens. Quite understandably, this unbridled power also extends to her progenies and the new son in-law entrant named Robert Vadra. Armed with nothing more than an all consuming “Gandhi” tag, Rahul is the Congress party’s offer to the nation as its future PM, no matter if he can ever qualify as a government clerk on his own. Robert enjoys yet more sinister power, thanks to the matrimonial gift he received as a first family member. Otherwise more befitting to be a bodyguard himself, this Gandhi son-in-law is surrounded by country’s elite Black cats commandoes to guard him by virtue of merely being married into the first family. Robert may also be the only businessman for whom others invest so that his wealth grows and raising capital is only a matter of his wish than his business credibility. What makes the latest allegations against Robert more significant is the vigour with which congress spokesperson are attempting to defend him instead of the man himself. The sheer vulgarity of subjugation, sycophancy and servility to the first family gets all too evident if one witnesses the scornful and hyped manner senior congress ministers attack anyone who points fingers at Gandhi family. Arvind Kejriwal has stirred an hornet’s nest . It almost appears that Sonia has let loose her pack of loyal mongrels to bark and bite anyone who attempts to throw stone at the family. Robert is above suspicion because he is now related to India’s first family, is the message that Jayanthi natrajan conveys through her scornful looks. Don’t dare to point finger at Gandhi family or you will be taught a lesson is the veiled threat of Salman Khurshid’s hyper-ventilated defense. In short, as per this self styled loyalist of Gandhi legacy, the burden of defending the family honor rests with the nation. Anything less is blasphemous and will be met with an iron fist. Given the nature of divided polity and an equally unimpressive alternative to a sycophant party like congress, we as a nation may be destined to carry the burden of the First family for some time now .Individually, the members of the family will eventually fade out in the annals the history, but its spineless loyalists will ensure that the legacy will carry on. Let’s first agree to disagree a little. No doubt our country is under a dynastic rule for most of the period after Aug,1947 with ‘a Gandhi tag.’ But let’s recall the great JP’s movement and its aftermath in 1977 general elections. The congress party was routed miserably and Moraraji govt. came to power. The infighting within Janata party started between Moraraji group, Charan Singh group & Chandrashekhar was behind the screen with his evil designs to become the PM. Everyday, political scenario was changing and there was uncertainty every day., By the time Indira Gandhi had got elected to Lok sabha through a by-election from Chikmagalur (AP) constituency. Charan singh had been already the PM by the time,replacing Moraji Desai. The Janata Party govt. couldn’t survive more than two and half years. Being disgusted, people voted Congress party again to power with thumping majority with a hope that this govt. could continue for five years. Again what happened to Rajiv Gandhi govt. after the Bofors issue. Opposion won the election taking the name of Bofors gun. V.P.Singh was a hero in that election. Infighting again started in V.P.Singh govt. Dy.PM Devi Lal parted ways with V.P.Singh and India saw Prime Ministers like I.K.Gujral. Devagowda and Chandrashekher came into being one after another. Indian voters are not so bogus, they know how to change the govts. not populist to them.The biggest problem before the voters is today that they strongly believe that a non-congress govt. in this country won’t survive for full five year term.If one judges the present political scenario, the opposition party has 5-6 Prime Ministerial candidates. But can anyone suggest some multiple names from ‘Gandhi tag’ congress.? The opposition party in India lacks trust deficit from public. That’s the reason why people prefer a ‘Gandhi tag’ man other than a legend from a disintegrated opposion party. Thanks.